Something unusual is happening with our planet's magnetic field. For the past 160 years, it's been weakening at an alarming rate. Scientists are concerned that one day, our magnetic poles could flip like they did 780-thousand years ago. When that happens, we will lose a vital force field that keeps radiation from the sun and space at bay. It'll also scorch the technology our society depends on. Now there's one spot in particular scientists are most worried about. It's known as the "South Atlantic Anomaly." It stretches from Chile to Zimbabwe where the field is at its weakest. Right now it's hazardous for any satellites travelling through the zone because they're exposed to high levels of radiation. 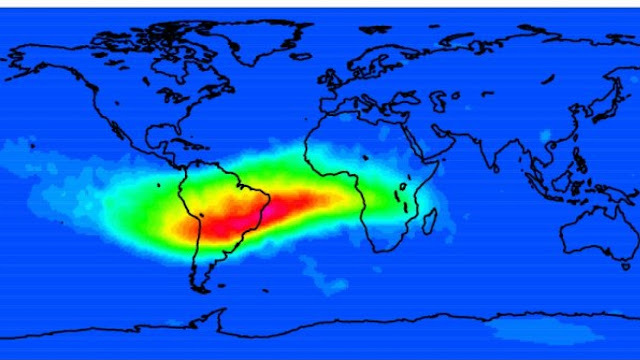 The "South Atlantic Anomaly" is also thought to have destroyed Japan's powerful X-ray observing satellite. NASA has even reported that Space Shuttle laptops crashed when passing through the zone. Scientists think the "South Atlantic Anomaly" could be ground zero for the flipping of the magnetic poles. Dr. John Tarduno, a geophysicist from the University of Rochester, wanted to put the present anomaly into a historic context. To do that, he got the help of some archaeologists and some funding from the National Science Foundation, to dig up some archeological data in southern Africa. "What we found working with archaeologists is kind of a unique record," says Dr. Tarduno. "The Bantu people who currently live there, they were the first people practicing agriculture. So at times of drought, you can imagine it was quite stressful on the population. And they practiced, according to the archeologists, a type of ritualistic burning. They would actually burn down their villages and then start anew." When the Bantu people burned down their villages, many of the structures are made of clay. And when that burns and then cools, the magnetic minerals in the clay locks in the magnetic field properties at that time. These burned down structures end up being like time capsule compass needles. Using this to look back into Earth's magnetic past, Dr. Tarduno says, "We think we see several episodes that are similar to what is happening today - that is the magnetic field is operating abnormally as viewed out of Africa." Dr. Tarduno thinks this recurrent phenomena is caused by a disturbance in the Earth's outer core layer where the magnetic field is generated. "If we look at our best numerical simulations of a magnetic field reversal, this is the type of pattern we see right before a reversal," says Dr. Tarduno. "We don't know if the current [anomaly] will lead to a full reversal." If the anomaly continues to grow, the patch in the outer core under Africa could be the trigger to a full pole reversal. Even if it doesn't result in a full pole reversal, if the Earth's magnetic field continues to weaken, it could still have negative effects on society. Our modern technology will be less protected from incoming space radiation and solar storms. And we'd be less protected from the harmful UV radiation coming from the sun.